The people within the district of Mahabshah in the province of Hajjah, went on a massive armed protest to condemn the crimes of the Saudi-led coalition and violations. The participants condemned the unjust blockade imposed by the coalition on the ports and airports without any justification or international action deterrent or practical to stop such violations. 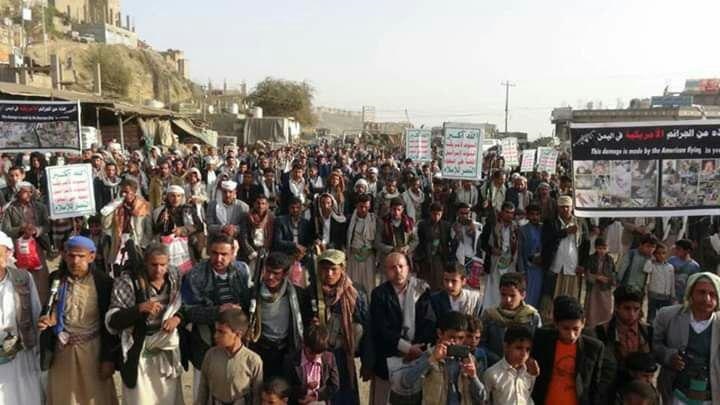 During the mass protest, people of al-Mahabshah declared their continuous and strong support to the fronts with financial aid and recruited men to defend the land of Yemen and defeat the ”invaders”. They say they will not stop until the victory and the country is safe. How does the Yemenis react after the Saudi-led coalition kills, injures about 4,000 Yemeni childern?